October 10th marks the 50th anniversary of the release of one of popular music’s most iconic songs of all time, The Beach Boys’ “Good Vibrations.” The Beach Boys and Capitol/UMe will celebrate the golden milestone with the worldwide release of Good Vibrations (50th Anniversary Edition) on a 12-inch sunburst vinyl EP on October 7th. Named the “Greatest Single of All Time” by MOJO magazine, “Good Vibrations” is a musical treasure for the ages. The Good Vibrations (50th Anniversary Edition) vinyl EP features the original 7” single version, an alternate studio take, an edit of the song with elements from various sessions, an instrumental, and a live version from a Honolulu rehearsal in August, 1967 that was originally intended for the lost album Lei’d in Hawaii, plus the single’s B-side, “Let’s Go Away For Awhile.” A pull-out lithograph of the single’s original Japanese cover art, with its “Good Vibration” title typo intact, is included in the EP package, which features the original 1966 U.S. single cover art on its front. 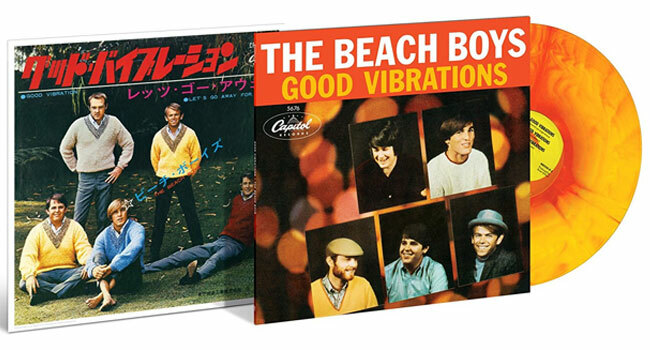 Fans in North America and the U.K. are invited to share their “Good Vibrations” with The Beach Boys for a chance to be featured in a special 50th anniversary tribute video. 2016 is a golden year for America’s Band. In June, The Beach Boys’ Pet Sounds (50th Anniversary Edition) was released worldwide in several configurations, including a 4 CD/Blu-ray Audio collectors edition presented in a hardbound book, featuring the remastered original album in stereo and mono, plus hi res stereo, mono, instrumental, and 5.1 surround mixes, session outtakes, alternate mixes, and previously unreleased live recordings; a 2 CD and digital deluxe edition pairing the remastered album in stereo and mono with highlights from the collectors edition’s additional tracks; and remastered, 180-gram LP editions of the album in mono and stereo with faithfully replicated original artwork. The Beach Boys continue to hold Billboard / Nielsen SoundScan’s record as the top-selling American band for albums and singles, and they are also the American group with the most Billboard Top 40 chart hits (36). “Good Vibrations” was inducted into the GRAMMY Hall of Fame in 1994. Sounds Of Summer: The Very Best Of The Beach Boys has achieved triple-Platinum sales status and The SMiLE Sessions, released to worldwide critical acclaim in 2011, was heralded as the year’s Best Reissue by Rolling Stone and earned a GRAMMY Award for Best Historical Album.